Grammy Award-winning cellist Eugene Friesen comes to Bates College to offer a solo performance at 3 p.m. Sunday, Feb. 1, in the Olin Arts Center Concert Hall, 75 Russell St. Admission costs $10 for the general public and $5 for seniors and students. For more information call 207-786-6135. 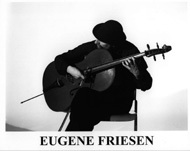 Renowned for his gift for improvisational music, Friesen has been featured in concerts all over the world with the Paul Winter Consort, Trio Globo and with poets Yevgeny Yevtushenko and Coleman Barks. “Friesen’s frenzied bowings and soaring melodies . . . sent many in the audience home in a state of musical rapture,” a Washington Post reviewer wrote. Friesen has performed as a soloist at the International Cello Festival in Manchester, England; Rencontres d’Ensembles de Violoncelles in Beauvais, France; and at the World Cello Congress in Baltimore. Freisen’s compositional credits include five albums of solo or duet music, as well as a symphony, an oratorio and scores for documentary films. He has worked and recorded with artists as diverse as Dave Brubeck, Toots Thieleman and Betty Buckley. He received a Grammy Award as a member of the Paul Winter Consort for the 1994 album Spanish Angel. CelloMan, the one-man show for young audiences that Friesen created in collaboration with maskmaker-choreographer Robert Faust, features a wide variety of music on solo cello — classical, jazz, blues and rock. The CelloMan video was released in 1999. Friesen is a graduate of the Yale School of Music, where he studied with Brazilian virtuoso Aldo Parisot. Today he is on the faculty of the Berklee College of Music, Boston, and lives in Vermont with his wife, Wendy, and their children.